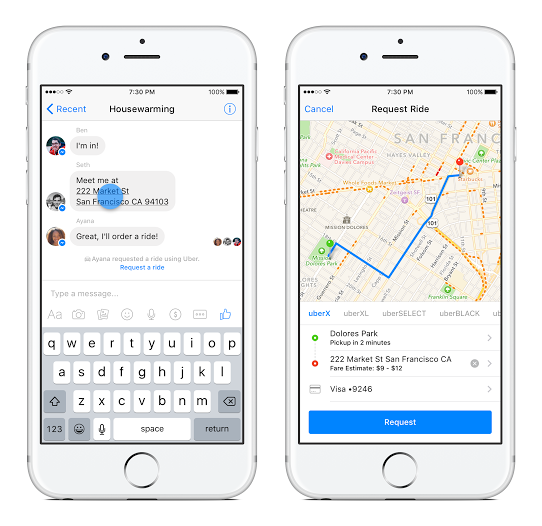 Facebook Messenger now lets you order “Transportation”, starting with Uber and with more services on the way. Facebook’s twist is that ordering a car via Messenger alerts those in your chat thread that you have indeed grabbed a ride…instead of you lying that you have while still in your pajamas. This isn’t the first time a ridesharing app has hooked up with a messaging app. WeChat, a messaging and calling app used outside the U.S. also allows users to book cars on ridesharing platforms such as China’s Didi. However, WeChat’s parent company Tencent blocked users from booking with Uber a number of times recently in an ongoing Chinese rideshare war. But Facebook claims this collaboration wasn’t necessarily inspired by WeChat. 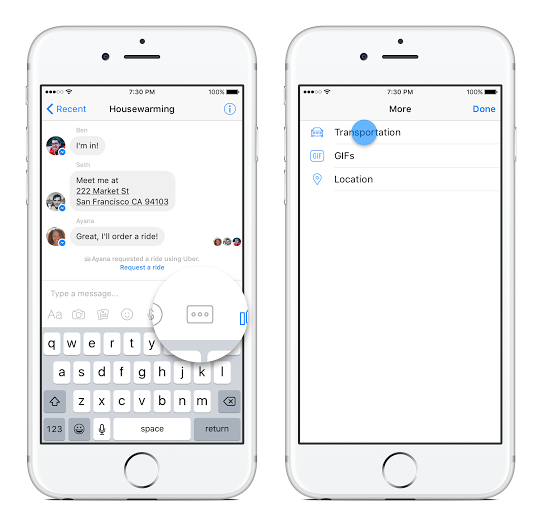 “For us we’re more inspired by how we see our users using Messenger and we just saw the growing popularity of group chats and this is one of the best use cases of why Messenger’s so great,” Facebook product manager Seth Rosenberg said. The new Uber in Messenger feature can be found by clicking on the car icon or finding “Transportation” in the three-dot “more” menu below where you write your messages. Either of those actions will open Uber’s Request Ride option where you can add your pick up location, destination, and car type. As we shared earlier this year at F8 (our developer conference) we’re building ways for you to interact with the businesses and services you care about right from Messenger. We believe that by doing so, we can provide more convenience and utility for both people and businesses.With group chats, Messenger is the best place to make plans with friends and family — 700 million of you do this worldwide. But why stop there? Plans are only as good as the follow-through. So I’m very excited to announce the launch of our transportation platform — to get you where you need to go faster, with your friends. This new capability will enable you to request a ride, receive updates on your driver's status, and notify your friends without ever leaving Messenger and your conversations.I’m also thrilled to launch this new experience with Uber. And to celebrate this moment together, you will get a free ride (up to $20 value) for a limited time. All you have to do is link your existing Uber account or setup a new one within Messenger and request a ride.To get started as of this afternoon, make sure you have the latest version of Messenger. Then, from within a conversation, tap the more menu (...) and choose Transportation. You can also search directly for Uber from the Inbox and tap the car icon in the composer to request a ride.As always, please try this new experience, enjoy your free ride, and let us know how we can make it even better for you! Everyone who uses Messenger Transportation will get a $20 Uber credit. It’s rare for Uber to hand out these kinds of free credits to people who are already users, but somehow Facebook convinced it to create a big incentive to use Messenger Transportation. Facebook and Uber would not comment on a possible revenue share with the new feature, but Facebook does plan to get into more offerings from businesses via Messenger. Rosenberg rattled off a bunch of use cases like booking flights or nabbing tickets in the app eventually. “We’re just getting people used to the idea that you can message more than just people on Messenger,” he said. That plan meshes well with Uber’s latest strategy for growth – use of its API on other platforms. Uber launched its developer platform earlier this year with an rev share offering of $5 per new user to entice businesses to embed the ‘Uber Ride Request Button’ within their apps. Lyft allows for a similar integration within Slack, but Uber is the first transportation partner to launch with the Messenger app, according to Rosenberg. Uber’s public API for its Request Ride button has a policy excluding partners from featuring it alongside competing ride services. However, Uber tells us that since the Messenger Transportation feature is built through a private integration, that anti-competitive policy doesn’t apply and Messenger can include other services like Lyft. Both Facebook and Uber sidestepped questions directly about a Lyft integration, but a source close to the matter tells TechCrunch that Lyft will offer rides through Facebook Messenger starting in January. Messenger already partnered with KLM for flight-booking option, but it’s been delayed until early next year. Uber also plans to use Messenger as a test case for real-time customer service – something Uber has been criticized for lacking much of. “We will start testing live support through Messenger to find out if this is the best way to start using real-time support through this,” Uber’s head of API and strategic partnerships Rahul Bijor said. There are 700 million people on Messenger, according to Facebook, and the ability to order an Uber through the app rolls out to a chunk of them in several U.S. cities today. An Uber spokesperson told TechCrunch the new feature will most likely be available to everyone in the U.S. by Christmas. That should make it easier to pick up friends in your Uber on the way to your next holiday party.